As pressures to preserve natural forest resources have increased, plantation forestry and its study have gained in importance. Plantation Silviculture in Europe is an up-to-date, timely, and comprehensive exploration of the principles that underlie the planting and maintaining of forest resources. 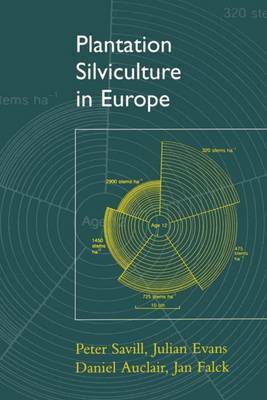 Based on the excellent reception of Savill and Evans' Plantation Silviculture in Temperate Regions (OUP, 1986), which was largely UK-based, the inclusion of two European authors ensures that the scope of this new book extends across the entire continent. Plantation Silviculture in Europe provides a thorough overview of the central aspects of conventional plantation forestry, covering site preparation, choice of species, establishment and maintenance, nutrition, spacing, thinning and pruning, and protection. In addition, it acknowledges the changing emphasis and increasing diversity of contemporary forestry, and includes chapters on community woodlands, urban forests, plantings for amenity and sport, and energy crops. Throughout, an attempt is made to set practices in the context of the ecological and biological forest processes which underpin them. Plantation Silviculture also incorporates discussion of the many environmental, social and policy issues that surround forestry today. Concise and clearly written, this will be essential reading for graduate and undergraduate forestry students and forestry professionals alike. Likely to become the standard text throughout Europe, it also contains much material of relevance to foresters in North America, East Asia, and Australasia.